Emblem of Kata'ib Humat al-Diyar, featuring Syria as the main part of the emblem and the group's name beneath it. The predominantly Druze province of Suwayda' in southern Syria has a variety of militia factions, some of which lean more third-way and reformist from within (most notably the Rijal al-Karama movement) and others of a more Assad regime loyalist orientation. Kata'ib Humat al-Diyar ("Guardians of the Abode Battalions," whose name references the Syrian national anthem Humat al-Diyar) represents one of the latter factions. It is led by Nazih Jerbo' (Abu Hussein), who is a relative of Sheikh Yusuf Jerbo', one of the three Mashayakh al-'Aql representing the highest religious authorities among the Druze in Syria. 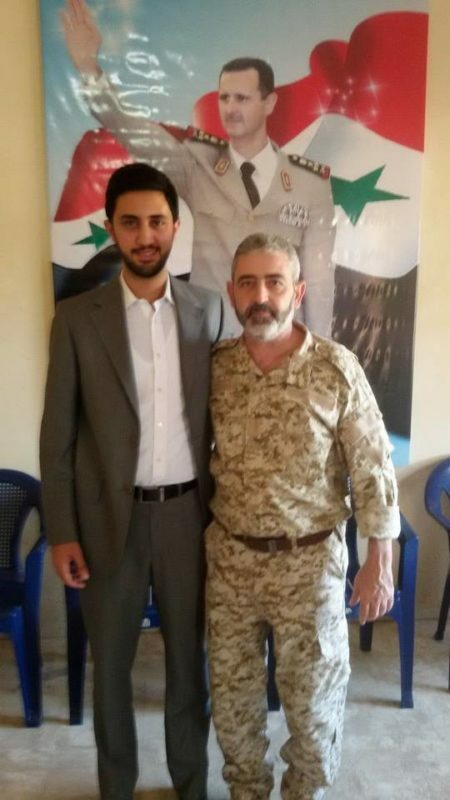 On account of the Mashayakh al-'Aql's links with the regime, Sheikh Yusuf Jerbo', who succeeded Nazih's father Hussein on the latter's death in December 2012, is firmly on the regime's side and indeed has played an important role in the building of Dir' al-Watan, a pro-regime formation in Suwayda' province that was set up more recently than Kata'ib Humat al-Diyar. According to Samir al-Shabali, who led a Kata'ib Humat al-Diyar contingent in the Suwayda' village of Ariqa but is now in the Kata'ib al-Ba'ath ("Ba'ath Brigades"), Kata'ib Humat al-Diyar's origins date much further back to 2012. 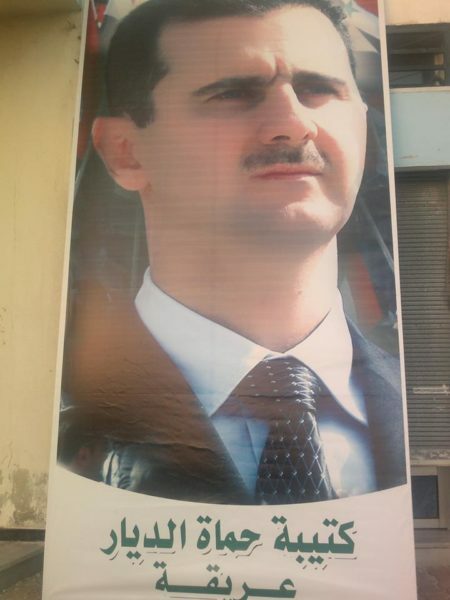 Kata'ib Humat al-Diyar Ariqa contingent placard, featuring Bashar al-Assad's portrait. Photo from June 2014. Photo featuring members of Kata'ib Humat al-Diyar with the group's logo on their jackets. The post says: "Kata'ib Humat al-Diyar: groups of lions of Suwayda' spread in all regions of the province to protect it from any emergency to which Suwayda' might be exposed during the past two days." Indeed, according to the media director for Rijal al-Karama, Kata'ib Humat al-Diyar has been around for a long time and has "many people" in its ranks, though he adds that the National Defence Forces in Suwayda' province is bigger than Kata'ib Humat al-Diyar. 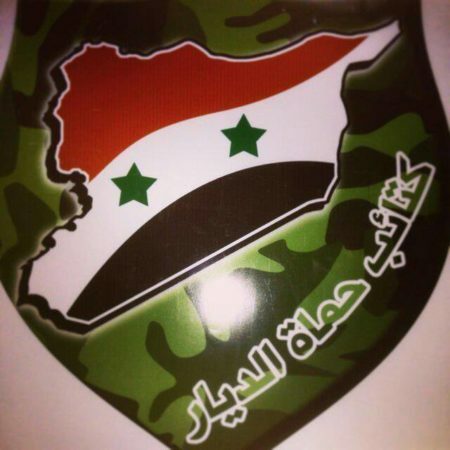 One member of Kata'ib Humat al-Diyar claimed that the formation has 2000 fighters. Considering Nazih Jerbo's relation with Sheikh Yusuf Jerbo', it is unsurprising that Kata'ib Humat al-Diyar also reflects a regime loyalist position. This stance is made very clear in the group's social media output. For example, in August 2015, Kata'ib Humat al-Diyar advertised a visit to its base from the Arab Unity Party "to affirm shared positions in protecting the mountain [Jabal al-Arab/Druze: Suwayda']." For context, note that the Arab Unity Party (Hizb al-Tawhid al-Arabi) is a Lebanese party primarily supported by Druze opposed to Walid Jumblatt, who has come out against Bashar al-Assad during the Syrian civil war. The leader of the Arab Unity Party- Wiam Wahhab- has played a notable role over the past few years in organizing efforts in Suwayda' province in defence of the regime. 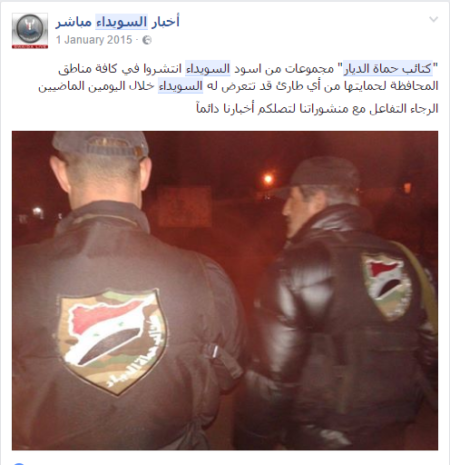 Indeed, the group even has a militia fighting in Syria- under the monikers of Katibat Ammar bin Yasir and the "Arab Tawhidi Resistance"- that has claimed 'martyrs' in fighting in northern Suwayda' in summer 2014 (though note the particular individuals named were also presented as 'martyrs' of the Popular Committees) and more recently in the Druze area of Hadr in Quneitra province in November 2016. The reference to Ammar bin Yasir- one of the companions of the Prophet- is a reflection of Ammar bin Yasir's importance in the Druze faith, while Tawhidi can refer to the "Unity" part of Wiam Wahhab's party, as well as the fact that Druze call themselves Muwahhideen ("monotheists": like Tawhid, based on the same derivative form of Arabic root w-h-d). The "Resistance" aspect clearly references the notion of the regional "resistance" axis supporting the regime. Photo from the post concerning the visit of the Arab Unity Party to Kata'ib Humat al-Diyar's base. Note the portrait of Bashar al-Assad in the background. Besides the meeting with the Arab Unity Party itself, Kata'ib Humat al-Diyar has participated in events convened by other factions supporting the regime in Suwayda', such as the Syrian Social Nationalist Party, which has an important base of support in Suwayda' province and opened a new base in Ariqa in July 2015, an event that was also attended by the National Defence Forces, Ba'ath Brigades and a local faction known as the Ammar bin Yasir group, an obvious reference in this case to the shrine in Ariqa for Ammar bin Yasir. According to Samir al-Shabali, this Ammar bin Yasir group is independent and relies on arming from local people. Therefore it should not be confused with the Arab Unity Party's Katibat Ammar bin Yasir that is fighting in Syria. Kata'ib Humat al-Diyar has engaged in other forms of local outreach such as through hosting local sheikhs for meetings, who have visited both the group's base and the house of Nazih Jerbo'. These meetings, advertised in June and August 2015 respectively, partly reflected the same and familiar rhetorical stances, such as standing united against threats from "terrorism" and/or the "enemies of the homeland," while warning against fitna ("strife"). The concept of fitna is a common talking point within discourse in Suwayda' province, referring most notably to the dangers posed by internal partisan rivalries that can distract from threats that the province is facing from outside forces such as the rebels to the west in Deraa province and the Islamic State to the northeast. This is particularly relevant in the case of the competition for influence between Rijal al-Karama and the loyalist factions in Suwayda' province. Kata'ib Humat al-Diyar's activities on the ground, as promoted by the militia itself, primarily concern maintaining internal security in Suwayda' province including inside Suwayda' city alongside popular committee militias that are also aligned with the regime. The main military engagement that appears to have been claimed by the militia outside Suwayda' province thus far came amid the mobilization of Syrian Druze to defend the village of Hadr after the rebels launched a new offensive in the area in September 2016. Though the maintenance of internal security has included battles within Suwayda' province such as one in May 2015 that was fought in the Haqaf area in eastern Suwayda' province in coordination with multiple factions (including Rijal al-Karama)against the Islamic State, Kata'ib Humat al-Diyar mainly seems to focus on confiscating smuggled goods, such as medicines, drugs and oil. Portraying itself as a group upholding the state and the nation, Kata'ib Humat al-Diyar says that the medicines and oil in particular are bound for areas like Deraa under rebel control, and thus the smugglers are bartering with people's lives and the nation's existence for the sake of profiteering. In the case of smuggled medicines, in May 2015 the group claimed that its leader directed sending confiscated medicines to the health directorate in Suwayda' by the agreement of Atef al-Nadaf, the provincial governor at the time. These medicines were then to be distributed to the various health centres in the province in order to help the children and sick. However, like many militias in the Syrian civil war, Kata'ib Humat al-Diyar faces accusations of criminal behaviour and acting outside the rule of law. For example, the anti-regime leaning Arab Druze Identity Movement, also known as The Identity Movement in Jabal al-Arab, wrote in May 2016 that one of the members of Kata'ib Humat al-Diyar killed a person from the village of al-Dur following a driving incident, but has been able to find safe refuge thanks to his affiliation with the militia. This event, the group adds, follows on from one last year in which the militia killed someone from the Murshid family. The latter incident involved the killing of a university student called Murad Sanad Murshid as armed men who had set up a checkpoint opened fire on his car. The exact identity of the perpetrators appears to be disputed. One account from the time of the incident in July 2015 says that the perpetrators were from the Kata'ib al-Ba'ath, though adds that the deceased's family initially thought Nazih Jerbo's men were responsible and accordingly attacked his home. It was partly in this context that the meeting with local sheikhs advertised in August 2015 by Kata'ib Humat al-Diyar came about, whereby sheikhs from the deceased person's village of Haran came to the house of Nazih Jerbo'. In a similar vein, the meeting advertised by the militia in June 2015 partly referred to another controversy in which Kata'ib Humat al-Diyar was accused of arresting, torturing and killing a few people from the Bedouin minority on the grounds of bombarding Suwayda' city. Again, as with the July 2015 incident, the identity of the perpetrators is disputed, with some accounts holding that it was actually al-Amn al-Askari (The Military Security: i.e. Military Intelligence) that carried out these acts and then accused Kata'ib Humat al-Diyar, which denied any wrongdoing. Even so, Kata'ib Humat al-Diyar is accused of being one of the leading groups relied on by the regional al-Amn al-Askari head Wafiq Nasir for kidnapping operations in Suwayda' province, a lucrative business said to be worth more than 850,000,000 Syrian pounds in the province in terms of ransoms paid. Also, despite the anti-smuggling image of the group, allegations also exist of certain members' involvement in profiteering through setting up checkpoints to allow smugglers to pass (e.g. here) or similar involvement in smuggling operations deemed detrimental to the security of the province (cf. here). In any case, this overview of Kata'ib Humat al-Diyar illustrates that the influence and size of the loyalist factions in Suwayda' province should not be underestimated, despite the growth of Rijal al-Karama. Indeed, third-way leaning groups cannot afford full-blown open confrontation with the loyalist groups as it would simply prove too costly, and ultimately the priority must be to defend Suwayda' province from external attack. As the media director for Rijal al-Karama put it, "In the event of an external attack on the Jabal, all factions unite." NB (2 December 2016): it may be noticed that in the source postings regarding the Hizb al-Tawhid al-Arabi's fallen fighters in Syria, the contingent is referred to as the "Yasir bin Ammar battalion." This is a typo in the source postings: it should read Ammar bin Yasir, as I wrote in the main text of the article. For comparison, see this posting on the party's website.